My name is Patrick Thompson; I am a volunteer at the Cancer support Group in Tallaght. I began my running adventure in 2014 when I ran with a couch to 5k app, since then I have ran half marathons, Marathons and one Ultra marathon in Connemara 64.6km's. This year I want to challenge myself along with raising money for a good cause and I have booked in to complete 8 Marathons in 8 Months. Half of them are spread out over the few months however four of them are in four consecutive days in August, this is called a Quadrathon and takes place around the coast of Donegal. With all of the events and training runs combined I will be running 2403km's this year, before I take a well earned break. 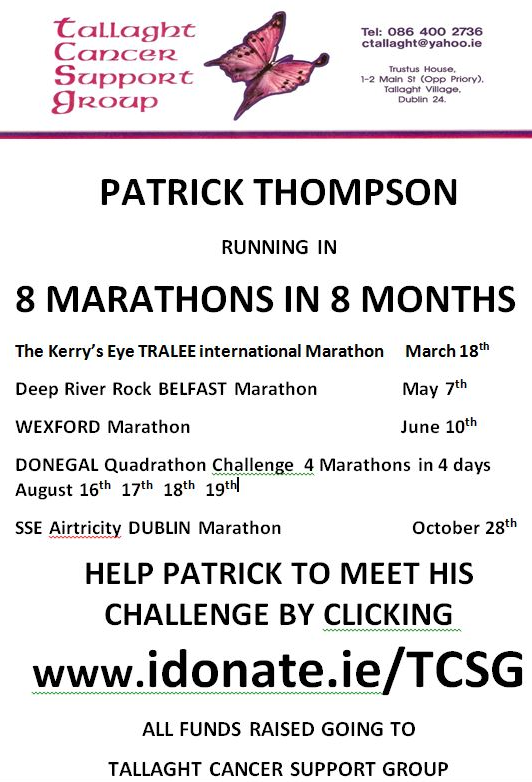 Fair play Patrick and all for a great cause! Good luck Patrick and good running.